PowerSwitch :: View topic - Aberdeen's Hydrogen Buses are GREAT! Aberdeen's Hydrogen Buses are GREAT! Posted: Fri Nov 25, 2016 12:32 pm Post subject: Aberdeen's Hydrogen Buses are GREAT! What's it like to ride a hydrogen bus in Aberdeen? Watch this BBC Scotland news report to find out. Peter Dow is a Scottish scientist and a republican socialist. There are serious reservations about hydrogen; if it's produced using wind or solar or some such, it's obviously 'less bad' than other energy sources but using that renewable energy more directly rather than producing hydrogen (e.g., directly charging batteries) might make more sense. No, I do not believe that you are missing anything. Hydrogen may be produced by electrolysis of water, but unless the electricity is 100% renewable and not needed for other purposes, the process is rather pointless. It would in most cases make more sense to use the electricity directly to work trams or trolley buses, or indirectly to charge the batteries in electric buses. As well as the electricity used in electrolysis, the energy used to transport and handle the hydrogen should also be renewable. Alternatively, hydrogen may be produced by chemical treatment of natural gas, but again pointless in most cases, it would make more sense to use natural gas to directly power the vehicle. 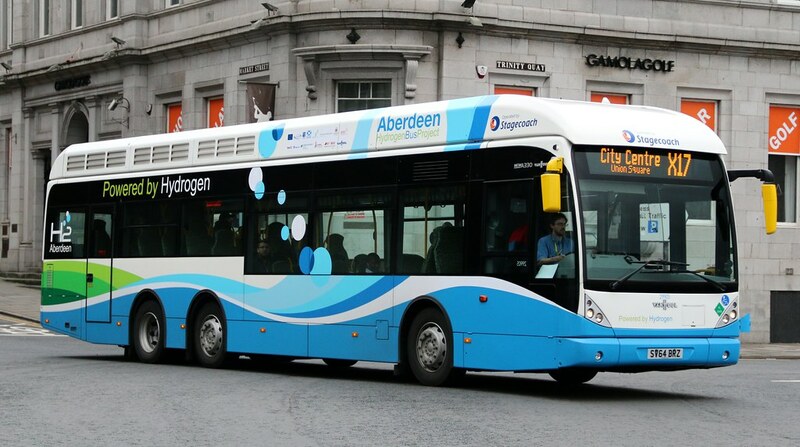 The Aberdeen Hydrogen Bus project produces hydrogen by electrolysis of water using power from the grid, which is partly powered by wind and solar. So Aberdeen's hydrogen buses use less fossil fuel than buses powered by petrol or diesel engines. but using that renewable energy more directly rather than producing hydrogen (e.g., directly charging batteries) might make more sense. Hydrogen tanks have a higher energy to weight ratio than electric batteries. So hydrogen vehicles (which are also "electric battery" vehicles) make more sense because they can have a longer range than battery-only vehicles. Oh, yes, the old phrase 'don't let the perfect be the enemy of the good' applies here. But adam2. Grid power does not have to be 100% renewable to have a lower carbon footprint in powering transport than 100% fossil-fuel powered trains or road vehicles. Battery-only road vehicles cannot perform as well in terms of range and power as hydrogen vehicles. Therefore hydrogen vehicles are more practical and will be introduced much faster and therefore will replace more fossil fuel vehicles in the transport system. So it will be the greater take up of very practical hydrogen vehicles that will lead to overall transport system lower carbon footprint. However low the carbon footprint of less practical battery-only vehicles, battery-only will do little to lower transport system carbon footprint because of low rates of take-up and usage. People will insist on sticking to their petrol guzzling cars unless and until they get offered a renewable vehicle (hydrogen) which has a practical range and power. Well where there is no infrastructure of tram lines or overhead power cables - almost everywhere in Britain - then hydrogen buses are cheaper, quicker and can go anywhere. Aberdeen's �19 million hydrogen bus project compares very favourably with Edinburgh's nearly �1,000 million (�776m cost + �200m interest) electric tram project. Hydrogen is an inherently problematic fuel to handle and store. For powering a vehicle, it must either be compressed to a very substantial pressure, which needs an expensive compressor that requires fuel (usually electricity) to run it. Alternatively, the hydrogen may be liquefied by extreme low temperature and then stored at extreme low temperature. The liquefaction also needs costly and energy consuming plant. I suspect that a modern lithium battery could give a range comparable to a hydrogen powered vehicle, after allowing for the bulk and weight of the special tank, not just the weight of the hydrogen itself. Fueling a hydrogen vehicle is more complex than simply plugging in an EV or sticking a hose into a liquid fuel vehicle. As regards the electricity used to make the hydrogen, it could reasonably be argued that this is 100% fossil fuel derived, mainly from natural gas and a little from coal. Wind, hydro, and solar sources are fully committed, they virtually always produce the maximum possible electricity from the available wind, water,or solar resource. The marginal fuel source for electricity generation is always FF, that is any EXTRA electricity demand is met by burning more gas or sometimes coal. And that's exactly what the Aberdeen Hydrogen Bus project does. Let's just agree to park that "alternative" in the long grass shall we? Simply put, hydrogen-powered cars have a better range and charge faster than traditional battery-powered vehicles." - From UK Business Insider "Hydrogen-powered cars are better than electric cars � but there's a catch"
The only "catch" being the lack of hydrogen refuelling stations, which will be overcome by public transport subsidies to build refuelling stations like the one for the Aberdeen Hydrogen Bus Project. Well it is the same electrical grid which powers electric trains and trams and recharges electric vehicles. So any weak argument which claims that somehow "all grid electricity is 100% fossil fuel derived" must equally apply to the grid electricity which powers electric trains, trams and recharges electric vehicles. Frankly, such a weak argument might be expected from a fossil fuel industry propagandist, paid to pour cold water over every renewable energy scheme proposed. Well sometimes wind turbines have to be constrained or curtailed to produce less power than the maximum possible because there is no demand or the local grid cannot transmit the power to where the demand is. In future, this missed energy opportunity may be seized with the introduction of (wind or solar farm) on-site power-to-gas energy storage, again producing hydrogen using otherwise unusable surplus electrical power. There is an issue with insufficient energy storage to supply power on demand, though burning biomass is another option there. We can address that partly also by building new pumped storage hydro for the grid as I've demonstrated can be done in another topic here. I will point out that electrolysis of water to produce hydrogen for transport can use off-peak electricity, when demand is low, when the wind is blowing strongly etc which does not add to the problem of meeting electrical power on demand. So it seems to me to be very strange and illogical to claim that electricity to generate hydrogen from water is somehow uniquely "100% fossil fuel derived". If one can argue such a case, then perhaps one should put a tin foil hat on to look the part. As with all things renewable there is a niche for hydrogen powered vehicles and when I say niche that could be 50 or more percent. We have to work out the best, most efficient, way of using our resources in the future and that should not be difficult to do. With buses their must be a route length/passenger density/seat occupation factor when the most efficient way of providing the service goes from grid powered tram to hydrogen powered bus to battery bus or even some form of taxi in all the previous options. We should be able to work out an hierarchy of uses ranging from hydrogen or battery powered vehicles in rural areas feeding buses or trams in towns feeding trains to cities where in turn they then feed trams or buses. I know that on one of the Scottish islands, whose name escapes me at the moment, surplus wind power is used to generate hydrogen which is them used as a back up for electricity generation. We need to be looking to generate a surplus of renewable power and then using various storage methods for their most efficient uses rather than squabbling about whether one system is better than another. They all have their niche use. My remarks regarding the electricity used for hydrogen production being 100% FF derived refer to the fact that grid connected renewables are already 100% utilised. Therefore any Additional electrical consumption cant increase renewable production but simply increases FF burnt. If the proponents of hydrogen powered vehicles were to erect wind turbines or PV modules that produced extra renewable energy at least equal to that consumed in the production and transport of the hydrogen, then IMO the idea has more merit. At present however, producing hydrogen from grid electricity simply increases gas burnt in power stations. Transmission and distribution losses are about 10% giving an overall figure of 36% so far. Electricity into hydrogen is about 50% efficient, giving an overall efficiency so far of 18%. No allowance made for any loses or escapes of the hydrogen, nor for the fuel used in compressing it. Consider also capital and running costs of the hydrogen production facility. ALL those options would be lower carbon and lower fossil fuel than the current hydrogen generation methods. Also they are now off the shelf technology, relatively affordable and with nationwide charging /refuelling network. Hydrogen is just a distraction.